What's new in NewsRob 1.9? The biggest feature in the new version allows for more fine grained control of the download process to reduce download times and storage consumption to the necessary minimum. On a related note it is now possible to define in which mode an article should be opened ("Feed", "Web"). That should make navigation quicker. The mentioned applications are just exemplary. 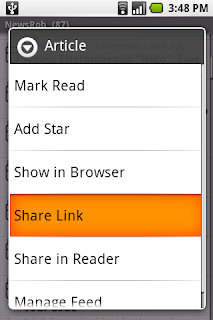 The actual applications on your phone that participate in sharing might be different (YMMV). Marcus also reported that he needs to set the synchronization schedule again after each update. The problem here is that an upgrade on Android is an uninstall followed by an install. And during the uninstall the scheduled alarms get uninstalled also – which makes sense – leaving the phone in a pristine state. Unfortunately the app doesn't get notified during the install process to (re-)establish any alarms. So for NewsRob that meant that the alarm was only re-scheduled when you visited the preference screen or when the phone was booted again. From this version on every time NewsRob is launched by the user it checks if auto-sync is enabled (the default) and if that is the case it schedules the next sync, if there isn't a schedule already. Still, if you don't launch NewsRob after an upgrade the auto synchronization will not resume until the next reboot. Another problem stemming from the above issue of not being notified when the app is installed or uninstalled is that NewsRob isn't able to properly clean up after itself. In particular the stored articles on the SD card are not removed during an uninstall. You can, of course, push "Clear Cache" before uninstalling it. This led to a problem where you installed NewsRob, uninstalled it and re-installed it at some later point. As the NewsRob database gots unistalled the downloaded files don't mean much anymore as the "index" is missing. So every time NewsRob instantiates a storage provider or switches it (phone memory <-> SD card) it cleans the old and new storage provider. So during a new install where NewsRob finds old files on the SD card, they get removed first. Unfortunately I forgot to put a progress monitor around it which lead to the dreaded "Application Not Responding" as well as to other weird GUI behavior. This has been fixed now. When ejecting the SD card in the middle of the "Reduce To Capacity" phase – NewsRob deletes the articles that are over the configured maximum number of articles – lead to a forced close with a NullPointerException. Hanaguro reported this problem and helped me over the course of many emails, tests and the use of Log Collector (Now that's a great Android Market rating!) to track the problem down. It is now fixed. Many thanks Hanaguro. With another user I exchanged a couple of mails on using NewsRob without a flat rate data plan. As a result there is a new option that not only for the content download, but also the auto-sync, you can now specify a "WiFi only" option. But, please be careful. NewsRob checks occasionally if WiFi is no longer available, e.g. between article downloads, between chunks of new articles, but this is very coarse grained. NewsRob is not cancelling the downloading of a file in the middle of the download. The upload-only synchronization that kicks in 5 minutes after the last status change, now is also dependent on the auto-sync setting. I'd also like to add, at least in my personal experience, the G1 loves to hop on and off WiFi. Having said that, I want to make sure you guys understand that NewsRob is a bandwidth hog, no matter which way you slice the issue. If you don't have a flat rate, please don't use NewsRob. And if you must, make sure that you go into "offline" mode by changing the APN settings automatically or whatever. Last and least new/changed feature: The article's context menu – as accessible by a long press on the article header on the Show Article Screen or on a row in the Article List – is now also the option menu (hardkey "menu") on the Show Article screen. And as always many more little details. Like with the next release - this one was tested, but there will likely be bugs small and possibly big that you will find and report. During the first three days of the release I will upload new versions frequently. So if you don't want to help testing the app and bugs and upgrades make you throw up, please wait another three days before taking the upgrade. With this release I now have implemented Feeds as entities of their own right, as opposed to just being the feed title as before. They are used to set the download and display references. In one of the next two releases I plan to surface them, so that they are one more level to browse through the articles. Also planned for one of the next two releases is the basic integration of Locale. For the releases thereafter I currently plan on fixing whatever bugs come my way, documentation (website, videos) and vacation. Maybe videos that are linked directly in the app are better?! Fixed a NullPointerException that happened during synchronization when a category doesn't have a label. I see that 10% of 1.9.0 is installed on Cupcake. Please give me feedback what else doesn't work. I am only aware that preferences changes are not always reflected in a new schedule. I do appreciate the release notes, but if it's taking too much of your time then perhaps you might consider posting a brief summary instead. Most importantly, thank you for developing such a great product! Hi there, i think Newrob is great, however the notifications don't seem to work, they download fine although i can't get them to pop up and notify me when new feeds are available, does anyone have any ideas how this can be fixed? Started using NR2.6.0 on MT3G. 60 feeds but some don't populate or show due to others filling up max capacity. 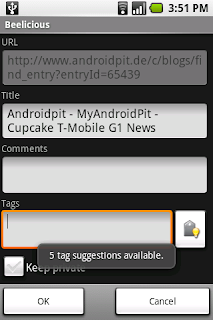 Coming from viigo on BB, is there any way to set max articles per feed to prevent this? Thanks. Hey how do i have more than 50 feeds in news bro. Marcus, no there is currently not. This is discussed on the mailing list also, but so far inconclusive. Namit, more than 50 articles? Go to Settings/Capacity. There you can configure a larger capacity. I'll purchase when you are able to manage the number of articles stored in each feed. This is the only feature that has value for my use of the application. Great work, and I'll continue to sing the app's praises to my friends. MOC, thanks for the praise, but sorry can't do it ;( The API doesn't let me do that in an efficient way. Mariano...any idea why Newsrob may not have uninstalled completely on my Droid / Android. The program appears installed in the Market, but is not on the phone. Suggestions would be appreciated. honestly, no. It's the first time I hear that. You're talking about the free version, right? What do you mean with "on the phone"? How do you check that? How do you know it appears installed in the Market? It says "installed"? Or does it say "purchased"? Do you get a button there "Uninstall"? The phone is a Droid, Android operations system. I uninstalled Newsrob from the applications menu. 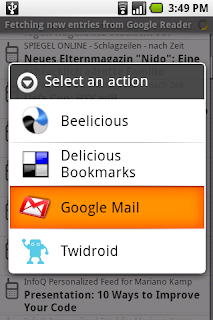 Now in the Android Market it still says the program is installed and Open and Uninstall are greyed out. I even deleted the folder on the SD card that was left after uninstalling Newsrob. Maybe another user knows how to deal with that? If you don't see the app anymore in the "Manage Applications" menu I don't think it's there anymore. The Market Application seems to be wrong then. If you have a SDK installed you could issue an "adb -d uninstall com.newsrob", but I wouldn't think you have the SDK installed. I am glad that it's working again for you and that we now have an explanation.